Way Past Due – Review of the 1st @BostonBrunchers Meeting! So, for those of you who read all of the other reviews, you know that this post is about a month past due. For those of you who don’t know about it, well…just the other weekend (hehe), a group of food bloggers got together for what would become the inaugural event of the @bostonbrunchers. It started when we attended a blogger event at Villa Francesca in the North End. As we are all completely obsessed with food, the sentiment was, why do we only meet for dinners, why not brunch? There is nothing better than brunch! 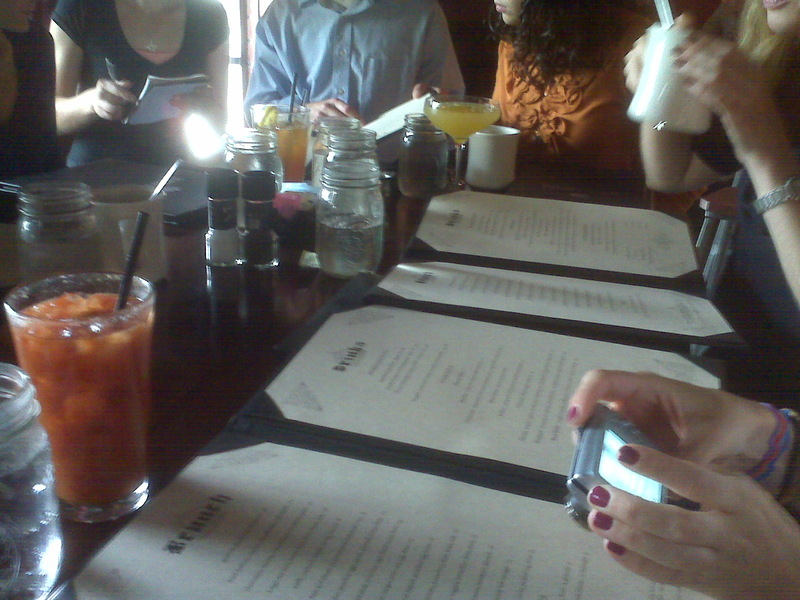 Well, we all know how much I like to plan things, so I immediately jumped on the idea and planned the #BostonBloggerBrunch at Lord Hobo in Inman Square. Little did I know what a huge hit this would be! By the end of brunch, it was decided that I would start the Twitter hand @BostonBrunchers, and that this would become a regular monthly meeting. Flash forward 1 month, our 2nd event is planned for November 14 at East Coast Grill, and all 24 spots were taken in less than 12 hours! I am also already in talks with several local venues to host brunches well into next year! I am so excited for this group, and for all my amazing new “foodie” friends! Lord Hobo started to pop up in various Twitter conversations late in the Summer. It is relatively new, and was starting to cause a buzz. So when I polled the other bloggers, Lord Hobo became a obviouse choice. The brunch menu is creative, and few of us had actually made the trip there yet. Before arriving I set my sites on either the pork belly hash, or the mushroom ragu. You will come to find out that us food bloggers generally spend HOURS exploring a restaurant’s menu before heading in…its an illness. I arrived at 10am to make sure we could get a table for all 13 of the food bloggers attending. The waitress was very sweet as we discussed the merits of the large booth vs the long table. 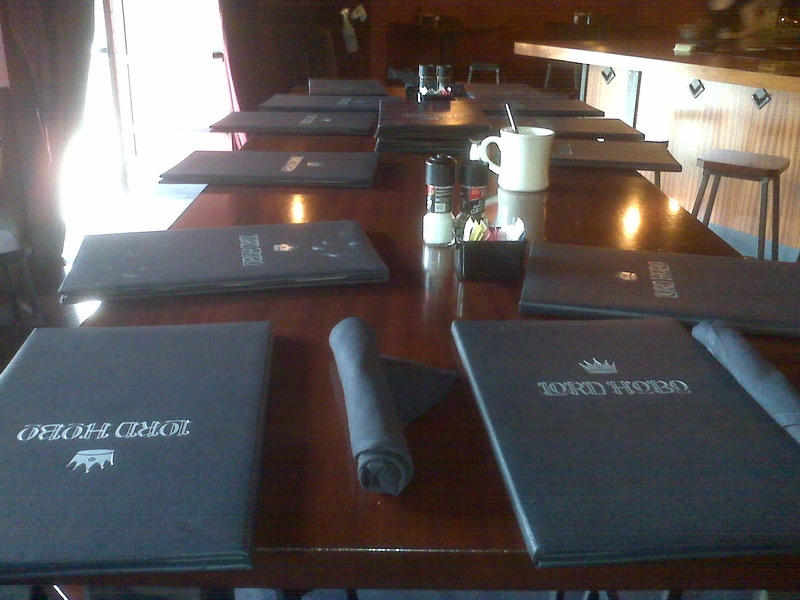 I went with the long table, which was the right choice. A cup of coffee was quickly delivered to keep me company while I waited. The Boston Food Bloggers began to arrive (all of their blogs are listed below) and talk of food, restaurants, drinks and events ensued. I tell you what, if you want to know where to go in New England, this is the group you want to talk to! No stone is left unturned. But now it is time to get serious. It is time to order. Remember how I said I had narrowed down my choices to two items. Well, the other thing food bloggers do is then stare at the menu again when we get to the restaurant in fear that we may make the wrong choice! There is nothing worse than wasting time on a bad meal! 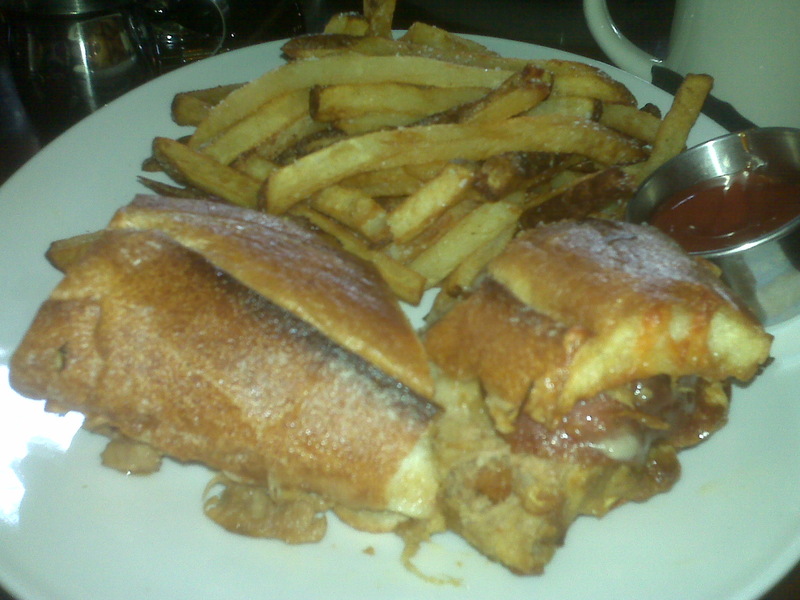 So, I made a game time decision and went with the Cuban w/braised pork, salami, swiss, pickled vegetables and fries. This sandwich was amazing! The meats were perfect, without being overbearing, and the pickled vegetables were fantastic, only lacking because there were too few of them. I definitely think I made the correct meal choice. Other meals around the table included the Pork Belly Hash, Eggs Benedict and Mushroom Ragout amongst other items. The general consensus was that the potatoes and most of the meals were delish, the only small problems was that the pork belly pieces were too large, and the poached eggs were overcooked. But for a table of 13, Lord Hobo did a great job of keeping us all happy and getting everything out in a timely manner. I highly recommend each and everyone of there blogs! In summary, it seems that BostonBrunchers are here to stay! We look forward to bringing you reviews of all that Boston has to offer for brunchers, so stay tuned! This entry was posted in Reviews and tagged #bostonbloggerbrunch, boston brunch, Boston Brunchers, Brunch, cambridge, east coast grill, food blogger, lord hobo, review by reneeh. Bookmark the permalink. Great recap! Looking forward to round 2.